Erica Bunker | DIY Style! The Art of Cultivating a Stylish Wardrobe: Review: Vogue 8808 | A Fun, Flirty, Fabulous Fit & Flare Frock for Fall! 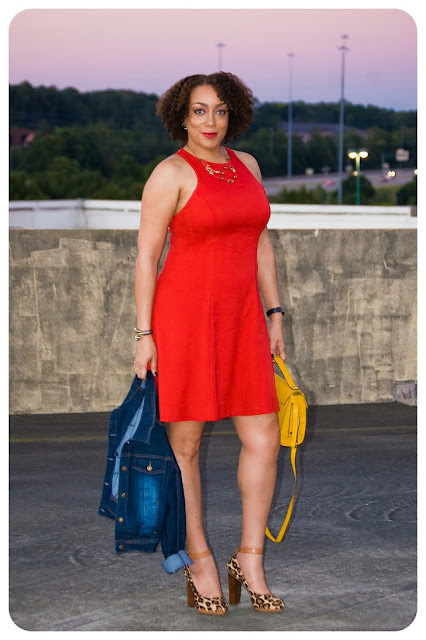 Review: Vogue 8808 | A Fun, Flirty, Fabulous Fit & Flare Frock for Fall! I betcha can't say that title 10 times! I really wanted a simple, plain version of Vogue 8900. And even though I could've altered the pattern, I've had Vogue 8808 ready to cut since last year. These are basically the same draft. I read the reviews for this pattern and the consensus is that it runs large, so I knew this going in. I cut the size 14 and ended up doing a lot of shaving down. I cut view A two inches longer so that I could have a 2" deep hem. Fuller skirts hang better with a wide hem. And I obviously omitted the mock turtleneck. It's just not cool enough yet for me to have wool around my neck. I used a "red" wool blend. It was red in the store under their harsh fluorescent lighting. But when I got it home, it was more orange-red or coral. I bought this fabric during the "Spot the Bolt" clearance, so no harm no foul. And this fabric which feels and handles more like a double knit was still great for this dress. 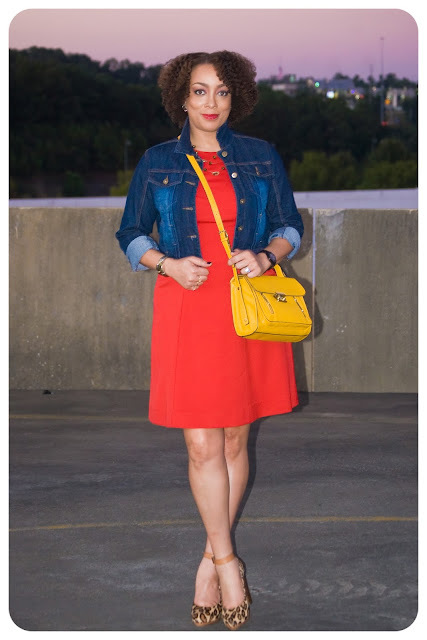 I decided to keep it weekend casual with a denim jacket, leopard pumps and a 3.1 Phillip Lim x Target yellow crossbody bag. Loving the styling so much and that colour looks awesome on you! It is very pretty. Great job as always. I like this version better than the black one. 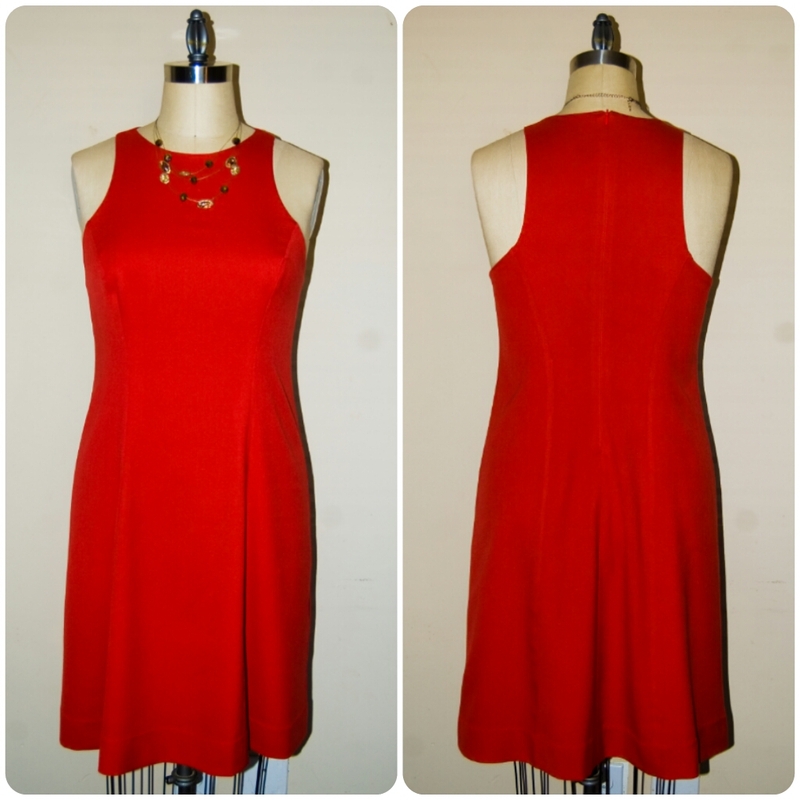 A reckon every girl needs a little red dress, and your delicious shoes to set it off. Super cute! I love it with the jacket and yellow bag for fall! Cute dress and I love the color! Great styling, too! You are simply GORGEOUS Erica! Love your dress! A smokin' dress -- love that color on you! It looks stunning on you! I made a red linen dress based on your review of 8900 and I love how it turned out. I was going to do it without the lace inserts but I'm glad I kept them. Now you have me thinking of a fall version of this dress in red! Here in Napa, September can be 80 degrees and this dress would fit the bill. 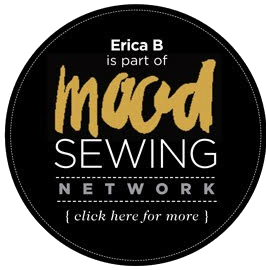 Erica inspires again! Michelle, I understand weather like that. It's 65 in the morning, 85 in the afternoon and in the mid 60s when the sun sets in the fall. I need to be able to remove layers! Thanks! Love the dress, Erica. 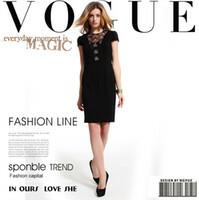 I went over to check out the pattern with your link to Vogue's website. This dress is suited to all body shapes! Unlike you with all your curves, I'm more of an "H" shape. I'll have to see if I can get the the next Vogue sale at Joann's. How did you get your hands on that purse?!!! By the time I make it to Taget to pick up that designer stuff the shelves are bare! No one in the Birmingham Metro Area cares about fashion! LOL I walked in Target around 9:30 am and it was empty! LOL I posted a picture on Instagram and everyone thought it was unbelievable. Because in other places, the lines were around the building waiting on the stores to open. No mine! I had my pick of whatever I wanted! So I got my two bags! Thanks Sheri! Erica, another great job! Bravo!! I'd like to ask. The adjustments you made on this pattern to fit ... would you recommend this pattern to be a starting point if someone is just learning about fitting? I am just in the begging stages of learning about fitting. I'm taking a few classes, and I'm set to take more classes at an expo in October. I love this pattern, but I've been hesitant to purchase it because I'm afraid I won't be able to fit it properly. I'd love to hear your thoughts! It could be if you had help with pinning. I put my zipper in and my husband pinned the back seams for me. You may want to make a muslin to work out your fitting issues. I like to live dangerously! Thanks! How beautiful! And I'm in love with your hair here. Gorgeous dress and I love the way you styled it! Another great make! You have such a great way with accessories, too. This dress looks so awesome on you - love the color. Just divine!! You look FABULOUS (as always ;) )!!! Beautiful dress! Love it on you. Happy birthday! what a great dress! I love the color! I thought for sure it was V8900 at first! I really love the racerback-in-the-front design of both these patterns. The dress looks great with impeccable styling - as usual. I've been stalking denim jackets all week. 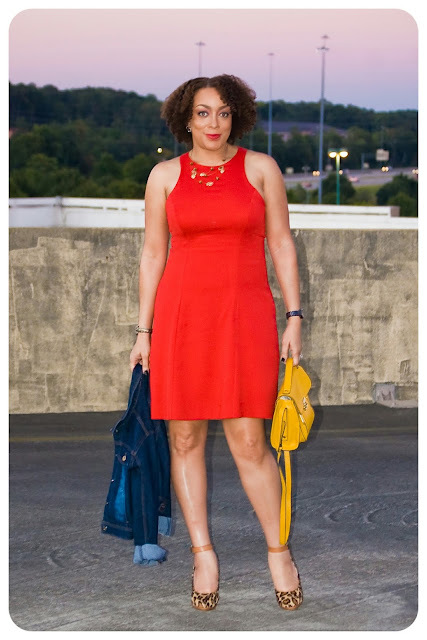 It's a great way to style the red dress. Very nice. Thanks Grace, it's my favorite thing to throw on! Love love love! One of my all time favorites that you have created and you look spectacular in it. Don't throw away that pattern....it should be a go-to for you. Just stunning. Red looks fantastic on you. I love the length and fit of this dress it's so cute!